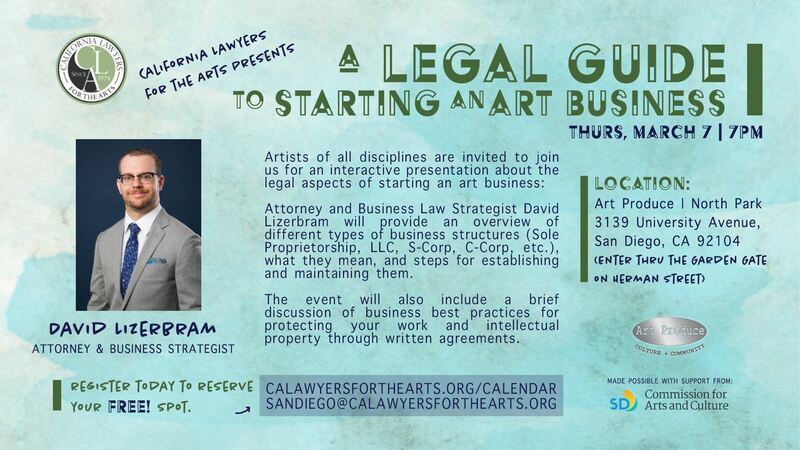 California Lawyers for the Arts invites artists of all disciplines to join us for an interactive presentation about the legal aspects of starting an art business. Attorney and Business Law Strategist David Lizerbram will provide an overview of different types of business structures (Sole Proprietorship, LLC, S-Corp, C-Corp, etc. ), what they mean, and steps for establishing and maintaining them. The event will also include a brief discussion of business best practices for protecting your work and intellectual property through written agreements. Speaker: David Lizerbram is a business law strategist and the host of the podcast Products of the Mind, a #1 ranked conversation about the intersection of business + creativity. He was born in Philadelphia and raised in North County San Diego, California. After graduating from the University of Southern California School of Cinema-Television (now the School of Cinematic Arts) and USC’s Marshall School of Business, he received his J.D. from Loyola Law School in Los Angeles. David founded his law firm, David Lizerbram & Associates, in 2005. David speaks regularly about legal matters, and has presented on a legal education panel at San Diego Comic-Con every year since 2008. In 2011, David was appointed by California Governor Jerry Brown to the Board of Directors of the 22nd District Agricultural Association, which is responsible for oversight of the Del Mar Fairgrounds. He served in that position until the conclusion of his term in 2015. He also served on the Board of Directors of the San Diego Music Foundation. David lives in North Park, San Diego with his wife, Mana Monzavi and their son, Miles. *This venue is wheelchair accessible and has gender neutral bathrooms available.